Benito Mussolini research papers discuss Benito’s personality traits that contributed to his ultimate failure as a fascist leader. This analysis of Benito Mussolini in a research paper begins with discussion of the leader’s personality traits contributing to his ultimate failure as a fascist leader. Benito Mussolini research papers show he often vacillated between decisions, depending on which official he was addressing. One official might leave Mussolini’s office with an order, only to be contradicted by orders given to the next in line. In addition, Benito Mussolini often deferred decisions on issues he felt uncomfortable with to his advisors, trusting them to make the correct decision. Benito Mussolini's failure to follow-up on these decisions would created disjointed policy. Vanity also presented a problem for Mussolini. Preoccupied with his image, he checked foreign newspapers for mention of himself twice daily. In addition, Mussolini ordered his Chief of Police to photograph the contents of the British Embassy safe. The photographs were then decoded, translated and analyzed for mention of the Duce. Despite such reliance on his subordinates for vital information, Benito Mussolini was extremely distrustful of those beneath him in the Italian political structure. He frequently replaced government officials, often without considering the qualifications of his replacements. Predictably, this often resulted in the dismissal of competent officials in favor of the inept. Such paranoia outlines an obsessive desire to stay in power, despite the results. Benito Mussolini insisted upon maintaining control in military arenas, even naming himself the supreme commander of each branch of Italy’s military. Mussolini's lack of knowledge led the leader to make grievous mistakes during the war. For instance, Mussolini declared the Italian Navy the key branch of the military, and allocated a large majority of military funds to this branch. The infantry, however, was forced to make due with outdated weapons and untrained personnel. 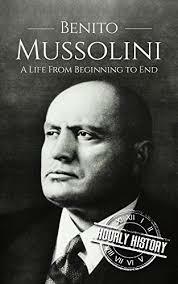 Mussolini also faced daunting obstacles in the Italian political culture and circumstances. For practical purposes, Italy existed as a divided society. Totalitarian Dictatorship research papers overview the term used by political scientists to describe a regime that seeks to control every aspect of life. Totalitarian Governments Research Papers - There are many differences between the two governments. In an authoritarian government, the dictator has all the power and control over the government. Fascist Regimes research papers explain that a fascist regime is any government that gives the state all power to control its nation. International Politics discuss the practices of politics and focuses on liberalism and realism. Authoritarian Governments Research Papers - Fascism research papers examine Hitler and Mussolini as examples of fascist leaders. Paper Masters writes custom research papers on Benito Mussolini and discuss Benito’s personality traits that contributed to his ultimate failure as a fascist leader.